Toys seem to multiply around the home when you have kids. Kids seem to love the toys when they are new and novel, but most toys quickly fall into the clutter and rarely get used again. The house was being taken over by toys. Too much to keep clean and organized. My kids couldn’t stay focused on the toys, they were distracted by the clutter. In an effort to clean up our home, we took about half our toys and stored them. The great benefit was that on a rainy or snowy day a few month down the road, we could take them all out again. Kids love that their toys returned and they regained the “novelty” factor. 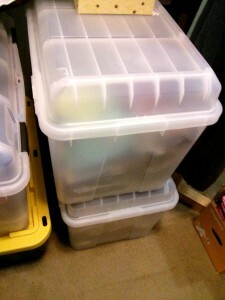 We consistently now rotate about 2-3 large bins of toys every few months. When we take toys out of a bin, it must be refilled with old toys. Fewer toys means less clutter and we are better able to keep their play space clean and organized. Decreasing toy options has increased my children’s attention and interest in the smaller selection they have left.